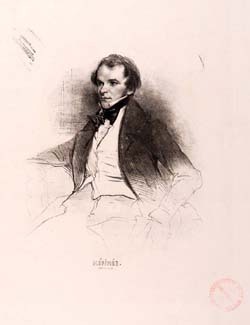 Prosper Mérimée (1803-1870) is appointed Inspector General of Historical Monuments and National Antiques in 1834. From then until 1840, he carries out four tours of inspection, which lead to an initial list of 1,034 monuments to be protected, published in 1840. The interest shown in the building and its staircase, at a time when Morlaix still features an urban network dating from the end of the Middle Ages and the Renaissance, results in the last-minute listing in 1883, saving it from the destruction that was the fate of its neighbours. Prosper Mérimée plays a leading role in the start of the official preservation policy for monuments worthy of interest. The former town house owes its rescue, half a century after the visit to Morlaix and the eulogy by the Inspector General, to the implementation of this policy. Prosper Mérimée was also particularly prompt to deem a number of monuments that did not meet with his favour of no interest whatsoever. Entire chapter on Morlaix by Prosper Mérimée (in French).